NASA has launched its most ambitious scientific balloon ever. On 28 December at 21:16 London time, technicians inflated and released a 532,000-cubic-metre aerostatic balloon from near McMurdo Station in Antarctica. It is the biggest test yet of a ‘super-pressure’ design that enables a helium balloon to stay aloft much longer than conventional balloons. If all continues smoothly, experts expect the flight to last for 100 days or longer. The current record for the longest NASA scientific ballooning flight is 55 days, using a traditional balloon. The record for a super-pressure balloon is just a day shorter, at 54 days. More time aloft equals more science. The super-pressure balloon is carrying a γ-ray telescope to hunt for high-energy photons streaming from the cosmos. Known as the Compton Spectrometer and Imager (COSI), it can detect where in the sky the rays are coming from, and thus begin to unravel various astronomical mysteries. COSI is the first science payload designed from scratch to take advantage of NASA’s super-pressure technology, says team leader Steven Boggs, an astrophysicist at the University of California, Berkeley. Its predecessors used liquid nitrogen to cool themselves, but nitrogen runs out in less than 10 days. COSI carries a mechanical cooler so has nothing to run out of. 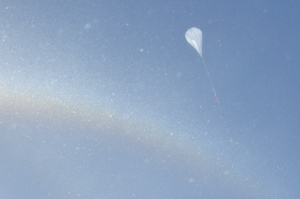 The balloon, flanked by a rainbow, as it ascended the Antarctic sky. The imager stares upwards and gathers data through the body of the balloon above it, which is transparent to the γ-ray energies it studies. It can scan about half of the sky overhead during the course of a day. One of its main goals is to measure the polarization of γ rays streaming from γ-ray bursts, black holes, pulsars and other cosmic phenomena. The longer it flies, the more data it will be able to gather. “The long flight time is key for this study,” says Boggs. NASA has been pushing to expand its balloon programme as a way to get payloads above most of Earth’s atmosphere without the expense of a satellite launch. Conventional helium balloons shrink at night, because the pressure of the gas inside them decreases as the temperature cools. The reduced volume makes the balloons lose buoyancy, and therefore altitude. The balloons regain some of that altitude during the heat of the day, but the constant fluctuations up and down make it harder to gather clean data. Actively adjusting for the fluctuations requires releasing gas and dropping of ballast, both of which limit the duration of the flight. By contrast, super-pressure balloons have embedded ropes that keep their volume roughly constant, helping them to maintain altitude in a passive manner. “It gives you a stable altitude when the Sun goes away,” says Debora Fairbrother, head of NASA’s balloon-programme office at the Wallops Flight Facility on Wallops Island, Virginia. NASA tested its 532,000-cubic metre super-pressure balloon in Kiruna, Sweden, in 2012, but the latest launch is the first to carry major science instruments. The balloon is carrying a payload of 2,300 kilograms to an altitude of about 33.5 kilometres. Because of the predicted length of the flight, the agency had to get permission from countries such as New Zealand in case the balloon drifts into their airspace, Fairbrother says. Conventional balloon flights that last only a few weeks generally make a circuit or two around Antarctica, blown by the circumpolar winds. If COSI goes as long as expected, it could leave the continent and move northwards. The COSI team has already seen its share of ballooning heartbreak. In 2010, during a conventional-balloon launch in Alice Springs, Australia, the instrument that was COSI’s predecessor was lost when the balloon failed to release from the deployment mechanism. The 28 December launch was also delayed a year because of a US government shutdown in October 2013, which cancelled much of the Antarctic research season. UPDATE: NASA brought the super-pressure balloon down two days after launch because of a leak. The balloon landed on the Antarctic ice about 560 kilometres from McMurdo Station. Researchers intend to travel to the landing site to recover the γ-ray telescope and the data it collected while aloft.